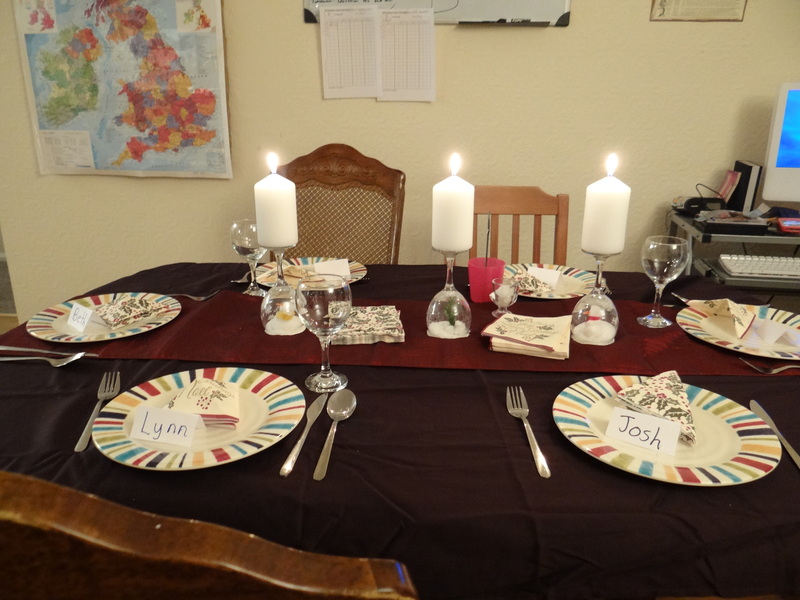 We had a lovely evening yesterday as our friends Kate and Lynn from the Crusty Bun came over for supper. Meg had a lot of fun decorating the table. She got a few ideas from Pintrest and took off with them. 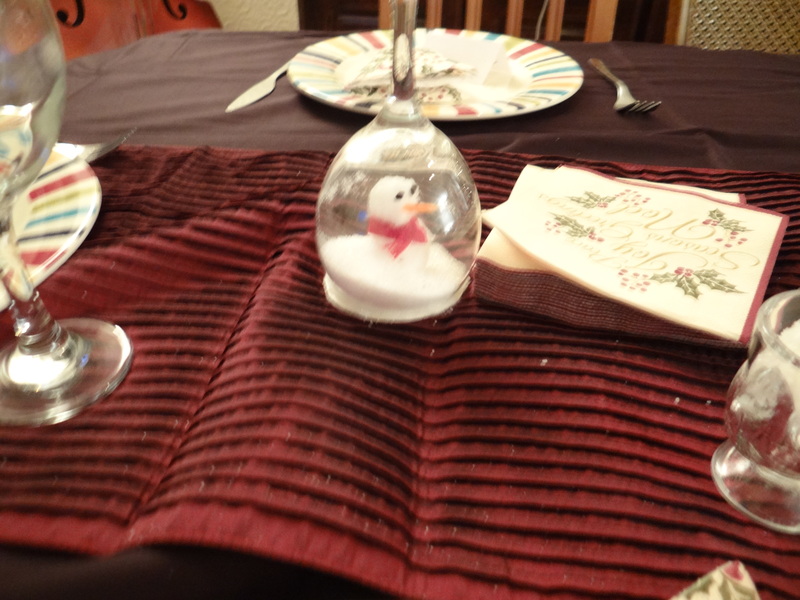 Meg made little snow globe scenes under three upturned wine glasses. She built tiny cotton snow men and we rolled them in glue and epsom salts. I thought it was interesting that you can not buy epsom salt except from the dispensing chemist (pharmacy) much like Sudafed in the US. It is OTC but you must ask for it and the “chemist” will sell you a small bottle for a pound fifty. I was surprised. In the US I purchase Epsom salt for making bath salts, soaking horse legs, gardening (makes roses look awesome) by the 5lb bag for a few dollars. Strange. 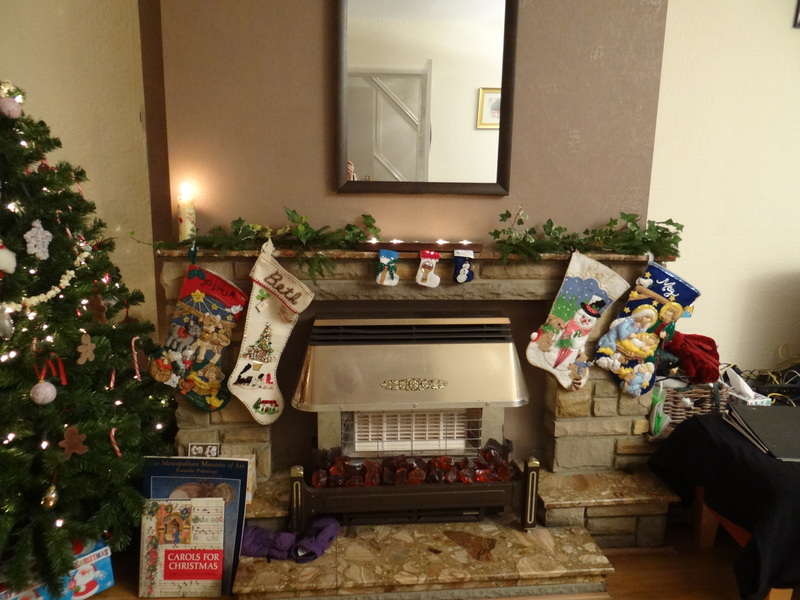 We brought our stockings from the US along with our elves,and nativity set and that has helped make it seem like home for Christmas. Meg and Kate practicing for snow. It was exciting to have Kate and Lynn over. 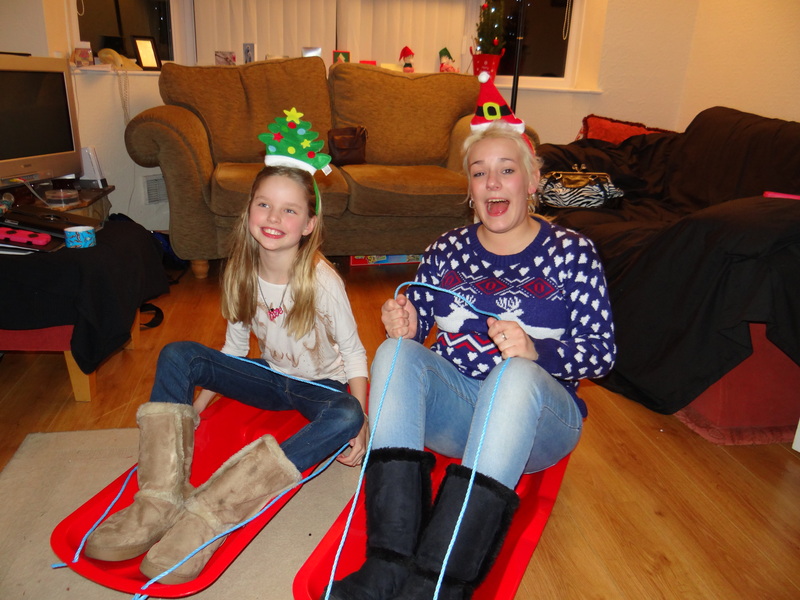 The kids enjoyed showing the new sledges off to our friends. Kate says as soon as we get snow she is coming right over to teach the kids all about sledges and making snowmen. Just got off the phone with a good friend from Fairhope. It was so nice to chat via our OOMA phone just like we are still in the US. Our weather here has been warmer some days than the weather back in Fairhope. Soooo I guess no snow soon for us yet. It has been between 55 and 32 here all week. Well, I must get back to my day. Thank you friends near and far away for traveling on this journey with us.